If you don't watch out, somebody might get hurt. That's right - I'm looking at you, Veggie Burrito. 95% recycled woven polypropylene. I really like the art on this bag, which is why I bought it! 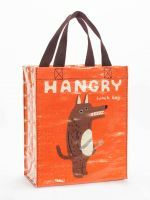 Really cute and funny design, plus it's a great size for bringing lunch and snacks! Super fun, bought for a "hangry" new baby boy. Filled it with bibs and other goodies instead of wrapping paper. I loves me some Blue Q! I love this bag. It is a great size, for carrying lunch, or not, and it makes me and others laugh. The artwork is humorous. It is sturdy and a fun little tote. I bought two and then a few more for the many admirers among my friends.